Costa Rica Expeditions / Do I need to keep track of any documents while I'm here? When you arrive, you will receive a welcome packet. This welcome packet will contain a number of documents that are helpful for your trip and we recommend that you take the time to go through its contents early on the day of arrival or the next morning. 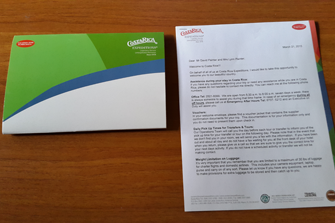 One of the items that is included is your booklet of vouchers. This is a colorful half-page size yellow and blue booklet, it has a Red Eyed tree frog on it and it says VOUCHERS on the bottom right corner. 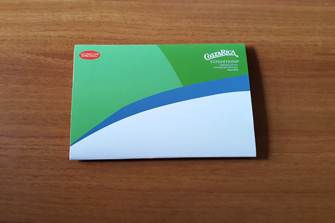 Inside of this booklet you will find printed copies of the vouchers that have ALREADY been emailed to each supplier on your vacation. You shouldn’t need to present them, but occasionally there is a discrepancy between what we think you have included and what the service provider thinks you have included. If that happens, the first place to go is the Voucher Booklet. The Voucher Booklet is organized in chronological order so the first voucher is your first service and your fourth voucher is your fourth service, so if you are in the middle of your trip start looking for the appropriate voucher at the middle of your booklet. If after showing the service provider your voucher they still don’t agree, call our Operations Department and they will sort it out immediately.